Azure Logic Apps helps you automate workflows and integrate data across Azure services, Microsoft services, other software-as-a-service (SaaS) apps, and on-premises systems. 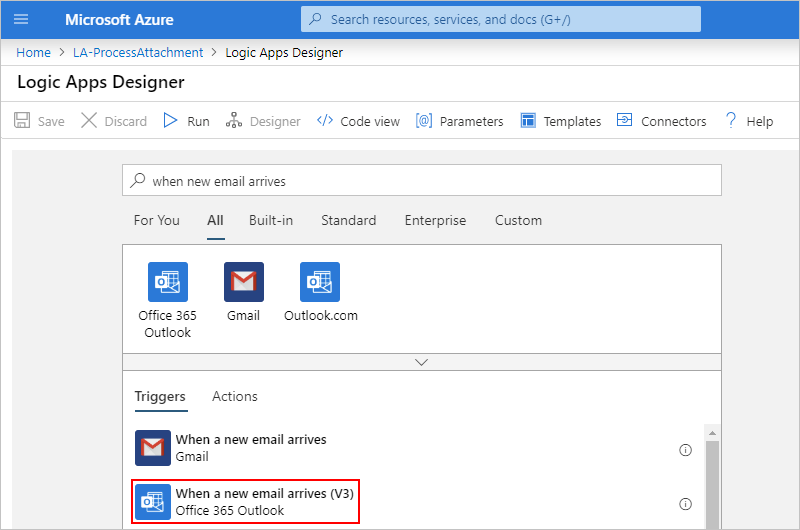 This tutorial shows how you can build a logic app that handles incoming emails and any attachments. 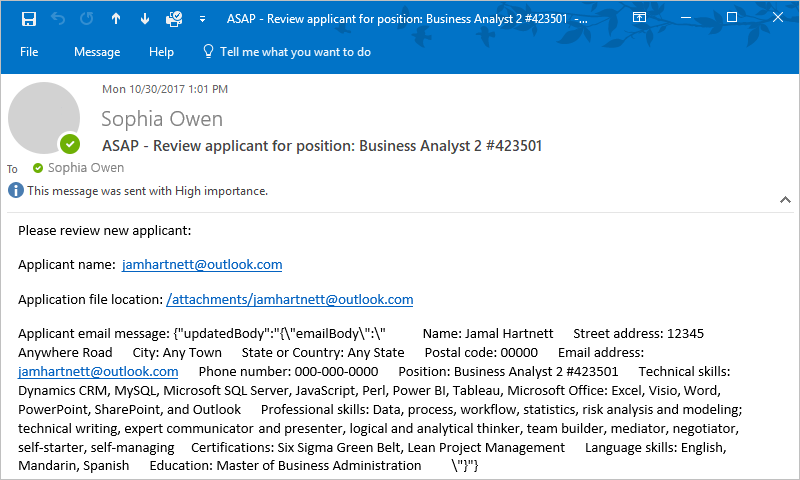 This logic app analyzes the email content, saves the content to Azure storage, and sends notifications for reviewing that content. Set up Azure storage and Storage Explorer for checking saved emails and attachments. 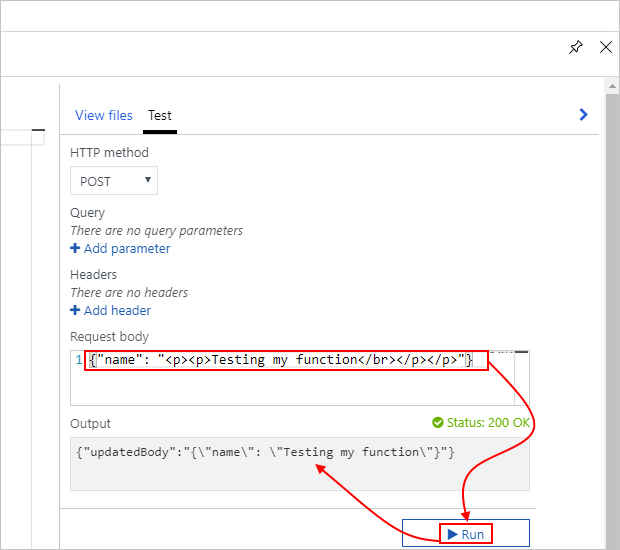 Create an Azure function that removes HTML from emails. This tutorial includes the code that you can use for this function. Add a trigger that monitors emails for attachments. 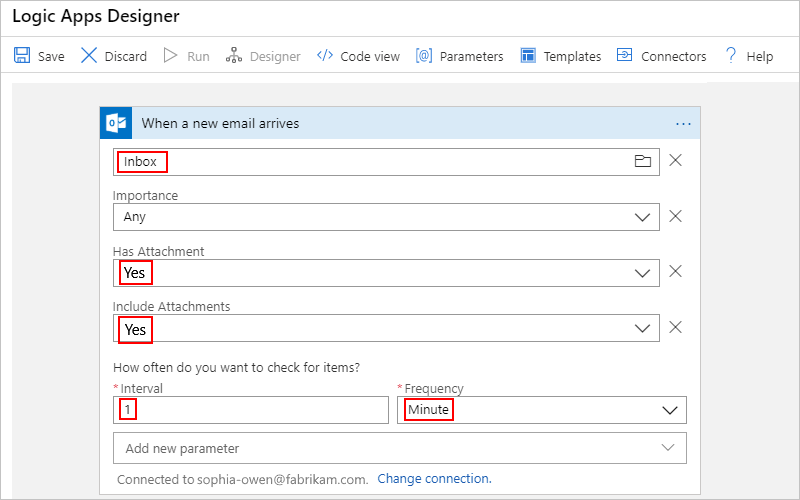 Add a condition that checks whether emails have attachments. 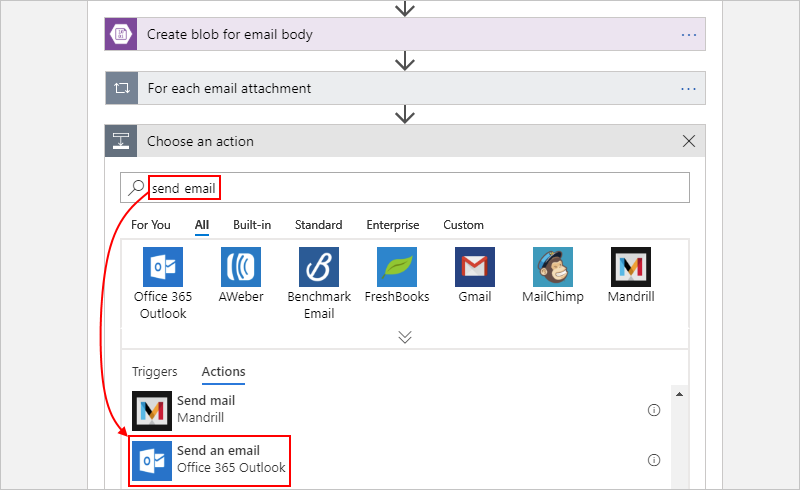 Add an action that calls the Azure function when an email has attachments. 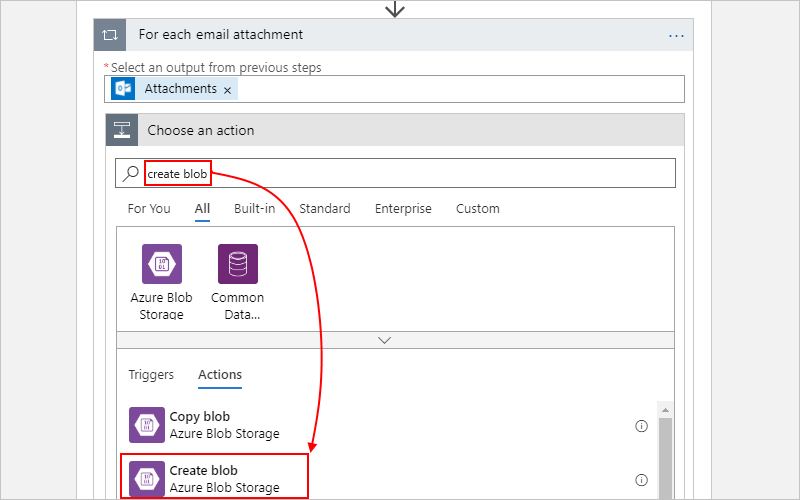 Add an action that creates storage blobs for emails and attachments. Add an action that sends email notifications. An email account from an email provider supported by Logic Apps, such as Office 365 Outlook, Outlook.com, or Gmail. For other providers, review the connectors list here. This logic app uses an Office 365 Outlook account. If you use a different email account, the general steps stay the same, but your UI might appear slightly different. Download and install the free Microsoft Azure Storage Explorer. This tool helps you check that your storage container is correctly set up. 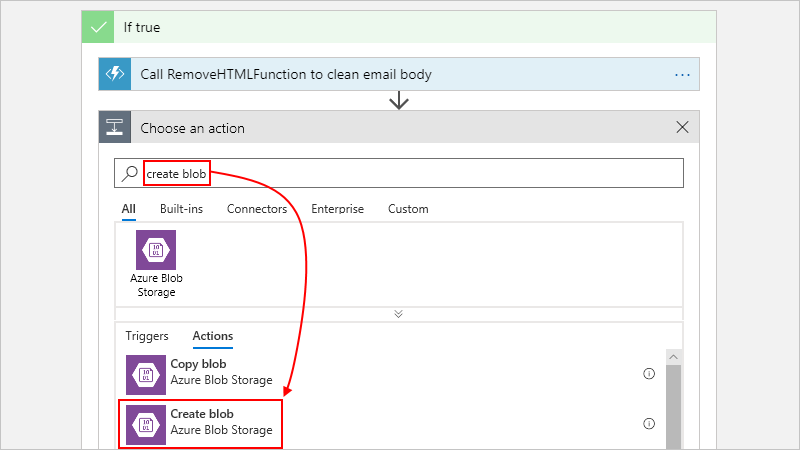 You can save incoming emails and attachments as blobs in an Azure storage container. Replication Locally redundant storage (LRS) This setting specifies how your data is copied, stored, managed, and synchronized. See Locally redundant storage (LRS): Low-cost data redundancy for Azure Storage. Performance Standard This setting specifies the data types supported and media for storing data. See Types of storage accounts. Secure transfer required Disabled This setting specifies the security required for requests from connections. See Require secure transfer. Resource group LA-Tutorial-RG The name for the Azure resource group used to organize and manage related resources. Note: A resource group exists inside a specific region. Although the items in this tutorial might not be available in all regions, try to use the same region when possible. Configure virtual networks Disabled For this tutorial, keep the Disabled setting. To create your storage account, you can also use Azure PowerShell or Azure CLI. On your storage account menu, under Settings, select Access keys. Copy your storage account name and key1, and then save those values somewhere safe. To get your storage account's access key, you can also use Azure PowerShell or Azure CLI. Create a blob storage container for your email attachments. On your storage account menu, select Overview. Under Services, select Blobs. After the Containers page opens, on the toolbar, select Container. Under New container, enter "attachments" as your container name. Under Public access level, select Container (anonymous read access for containers and blobs), and then choose OK.
To create a storage container, you can also use Azure PowerShell, or Azure CLI. Next, connect Storage Explorer to your storage account. Now, connect Storage Explorer to your storage account so you can confirm that your logic app can correctly save attachments as blobs in your storage container. Open Microsoft Azure Storage Explorer. Storage Explorer prompts you for a connection to your storage account. 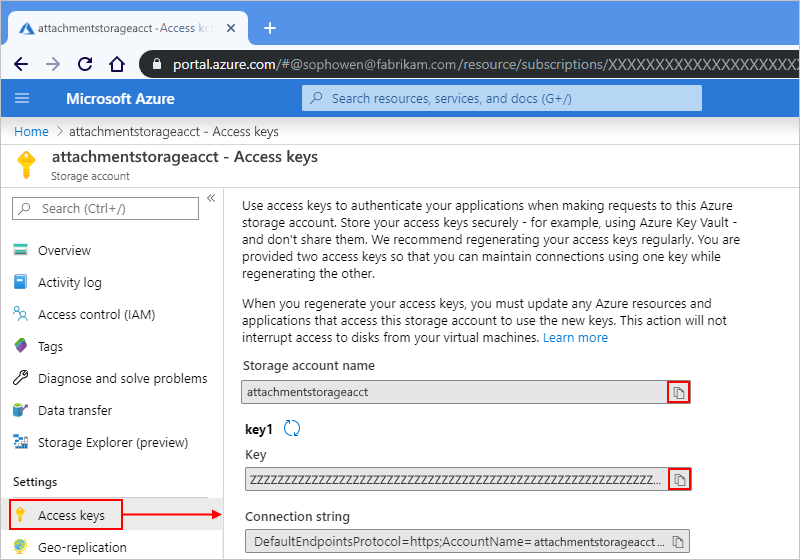 In the Connect to Azure Storage pane, select Use a storage account name and key, and then choose Next. If no prompt appears, on the Storage Explorer toolbar, choose Add account. Under Account name, provide your storage account name. Under Account key, provide the access key you previously saved. Choose Next. Confirm your connection information, and then choose Connect. Storage Explorer creates the connection, and shows your storage account in the Explorer window under (Local and Attached) > Storage Accounts. 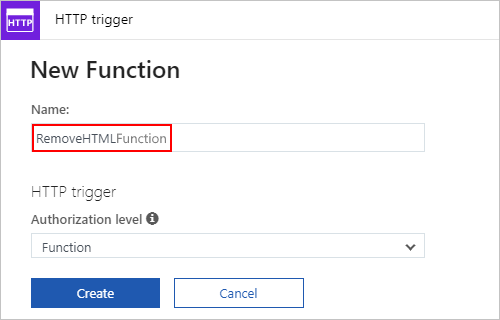 Next, create an Azure function that removes HTML from incoming email. 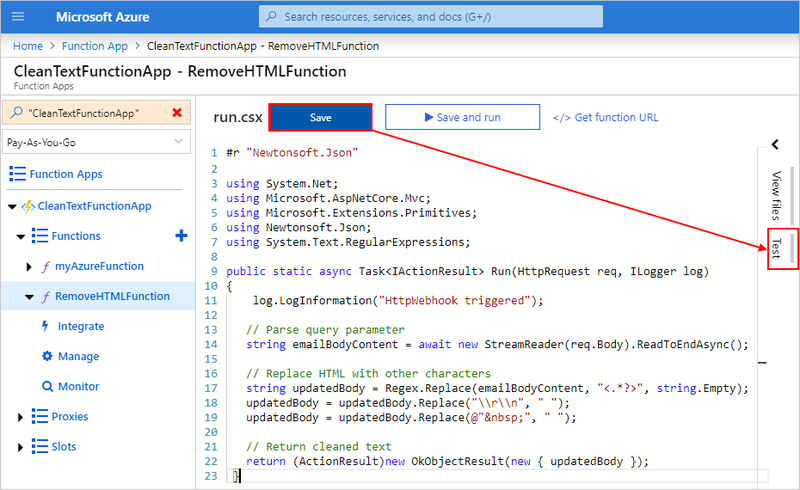 Now, use the code snippet provided by these steps to create an Azure function that removes HTML from each incoming email. That way, the email content is cleaner and easier to process. You can then call this function from your logic app. Hosting Plan Consumption Plan This setting determines how to allocate and scale resources, such as computing power, for running your function app. See hosting plans comparison. Storage cleantextfunctionstorageacct Create a storage account for your function app. Use only lowercase letters and numbers. Note: This storage account contains your function apps, and differs from your previously created storage account for email attachments. 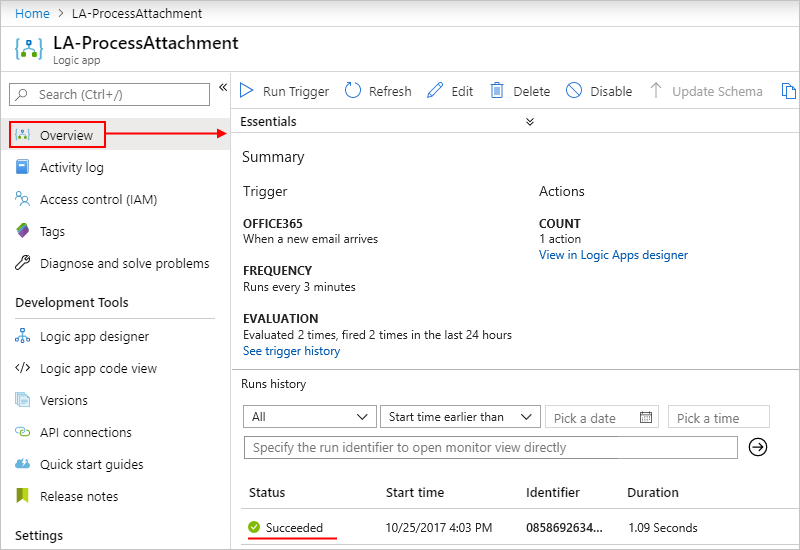 Application Insights Off Turns on application monitoring with Application Insights, but for this tutorial, choose the Off setting. 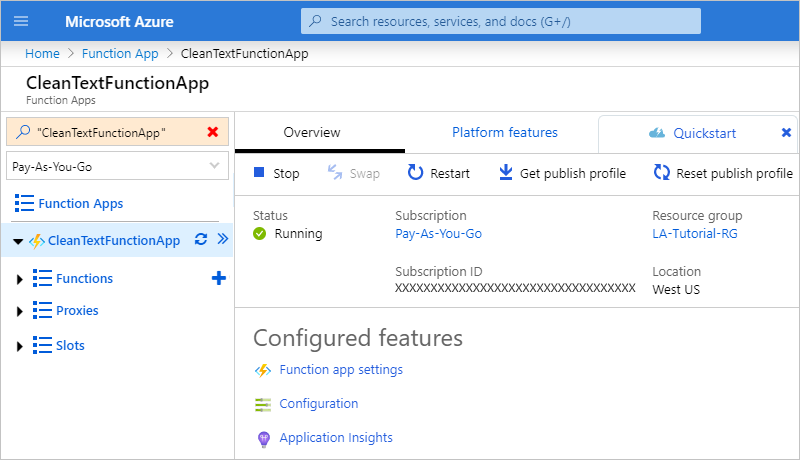 If your function app doesn't automatically open after deployment, find your app in the Azure portal. 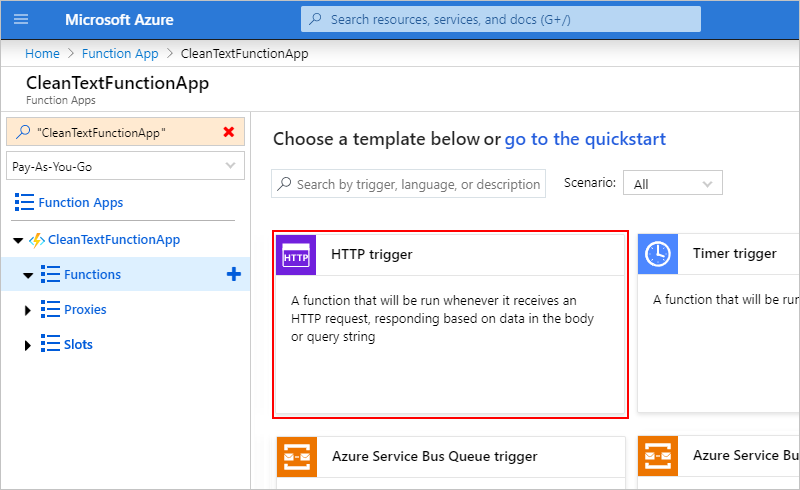 On the main Azure menu, select Function Apps, and select your function app. If Function Apps doesn't appear on the Azure menu, go to All services instead. In the search box, find and select Function Apps. For more information, see Create your function. To create a function app, you can also use Azure CLI, or PowerShell and Resource Manager templates. Under Function Apps, expand CleanTextFunctionApp, and select Functions. On the functions toolbar, select New function. Under Choose a template below or go to the quickstart, open the Scenario list, and select Core. In the HTTP Trigger template, select C#. This example provides you the C# sample code so you can follow the example without having to know C#. In the New Function pane, under Name, enter RemoveHTMLFunction. Keep Authorization level set to Function, and choose Create. When you're done, choose Save. To test your function, at the editor's right edge, under the arrow (<) icon, choose Test. In the Test pane, under Request body, enter this line, and choose Run. After checking that your function works, create your logic app. Although this tutorial shows how to create a function that removes HTML from emails, Logic Apps also provides an HTML to Text connector. 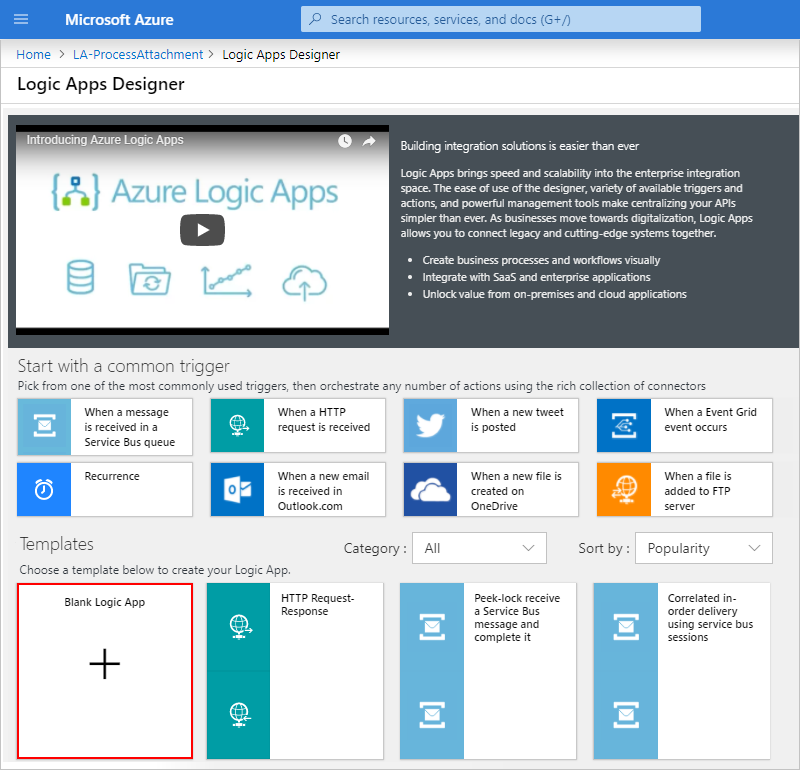 On the main Azure menu, select Create a resource > Integration > Logic App. Log Analytics Off For this tutorial, choose the Off setting. Next, add a trigger that listens for incoming emails that have attachments. Every logic app must start with a trigger, which fires when a specific event happens or when new data meets a specific condition. For more information, see Create your first logic app. If you're asked for credentials, sign in to your email account so Logic Apps can connect to your email account. Now provide the criteria the trigger uses to filter new email. Has Attachment Yes Get only emails with attachments. Note: The trigger doesn't remove any emails from your account, checking only new messages and processing only emails that match the subject filter. Include Attachments Yes Get the attachments as input for your workflow, rather than just check for attachments. To hide the trigger's details for now, click inside the trigger's title bar. Your logic app is now live but doesn't do anything other check your emails. Next, add a condition that specifies criteria to continue workflow. Now add a condition that selects only emails that have attachments. Under the trigger, choose New step > Add a condition. Create a condition that checks for emails that have attachments. On the first row under And, click inside the left box. From the dynamic content list that appears, select the Has Attachment property. In the middle box, keep the operator is equal to. In the right box, enter true as the value to compare with the Has Attachment property value from the trigger. If both values are equal, the email has at least one attachment, the condition passes, and the workflow continues. If your logic app isn't running already, choose Run on the designer toolbar. This step manually starts your logic app without having to wait until your specified interval passes. However, nothing happens until the test email arrives in your inbox. Your email has one attachment. For now, just create one empty text file and attach that file to your email. 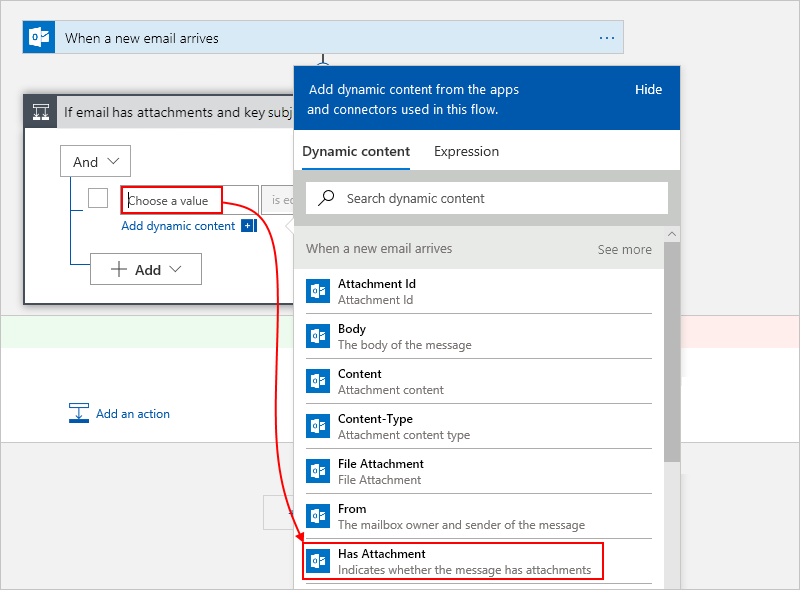 When the email arrives, your logic app checks for attachments and the specified subject text. If the condition passes, the trigger fires and causes the Logic Apps engine to create a logic app instance and start the workflow. To check that the trigger fired and the logic app ran successfully, on the logic app menu, choose Overview. If your logic app didn't trigger or run despite a successful trigger, see Troubleshoot your logic app. Next, define the actions to take for the If true branch. To save the email along with any attachments, remove any HTML from the email body, then create blobs in the storage container for the email and attachments. 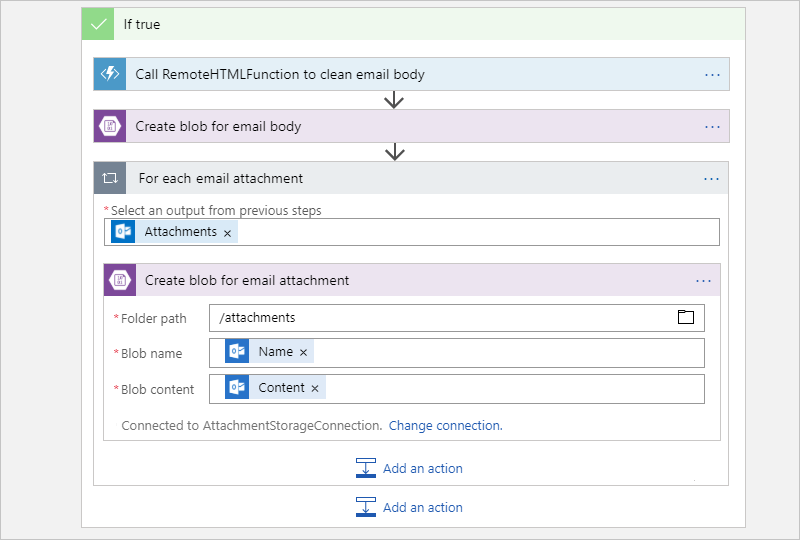 Your logic app doesn't have to do anything for the If false branch when an email doesn't have attachments. As a bonus exercise after you finish this tutorial, you can add any appropriate action that you want to take for the If false branch. 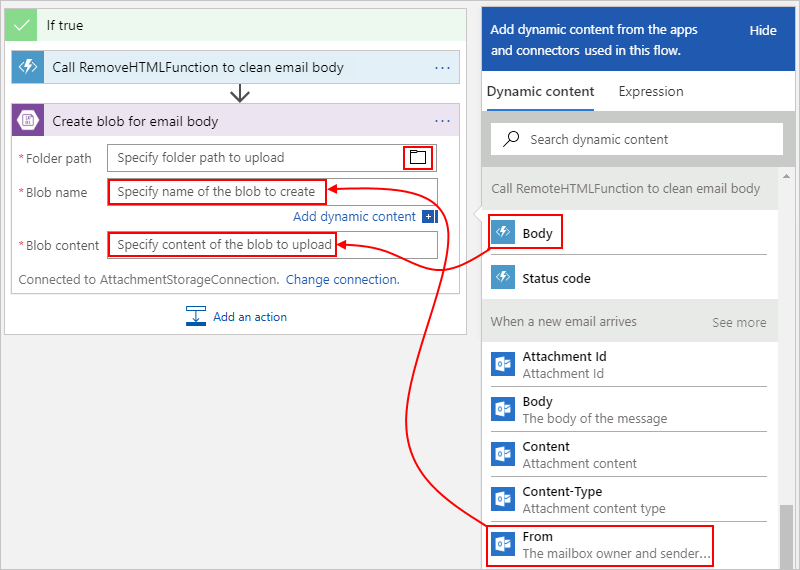 This step adds your previously created Azure function to your logic app and passes the email body content from email trigger to your function. On the logic app menu, select Logic App Designer. In the If true branch, choose Add an action. Now specify the input for your function to process. Also, when your cursor is inside the Request body box, the dynamic content list appears so you can select property values available from previous actions. Next, add an action that creates a blob in your storage container so you can save the email body. In the If true block and under your Azure function, choose Add an action. Create a connection to your storage account with these settings as shown and described here. When you're done, choose Create. Folder path /attachments The path and name for the container that you previously created. For this example, click the folder icon, and then select the "/attachments" container. Blob name From field For this example, use the sender's name as the blob's name. Click inside this box so that the dynamic content list appears, and then select the From field under the When a new email arrives action. Blob content Content field For this example, use the HTML-free email body as the blob content. Click inside this box so that the dynamic content list appears, and then select Body under the Call RemoveHTMLFunction to clean email body action. Your email has at least one attachment. For now, just create one empty text file and attach that file to your email. Check that your logic app saved the email to the correct storage container. In Storage Explorer, expand (Local and Attached) > Storage Accounts > attachmentstorageacct (External) > Blob Containers > attachments. Check the attachments container for the email. At this point, only the email appears in the container because the logic app doesn't process the attachments yet. When you're done, delete the email in Storage Explorer. Optionally, to test the If false branch, which does nothing at this time, you can send an email that doesn't meet the criteria. Next, add a loop to process all the email attachments. 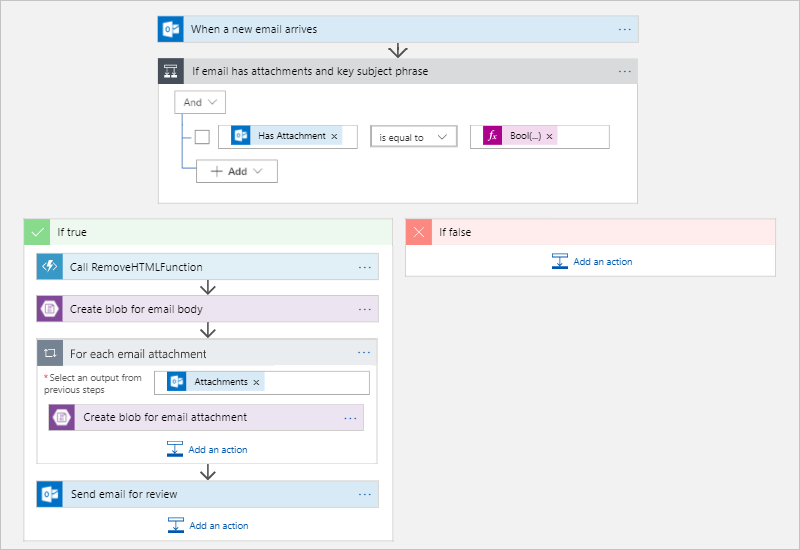 To process each attachment in the email, add a For each loop to your logic app's workflow. Under the Create blob for email body shape, select More > Add a for each. Now specify the data for the loop to process. Click inside the Select an output from previous steps box so that the dynamic content list opens, and then select Attachments. The Attachments field passes in an array that contains all the attachments included with an email. The For each loop repeats actions on each item that's passed in with the array. Next, add the action that saves each attachment as a blob in your attachments storage container. 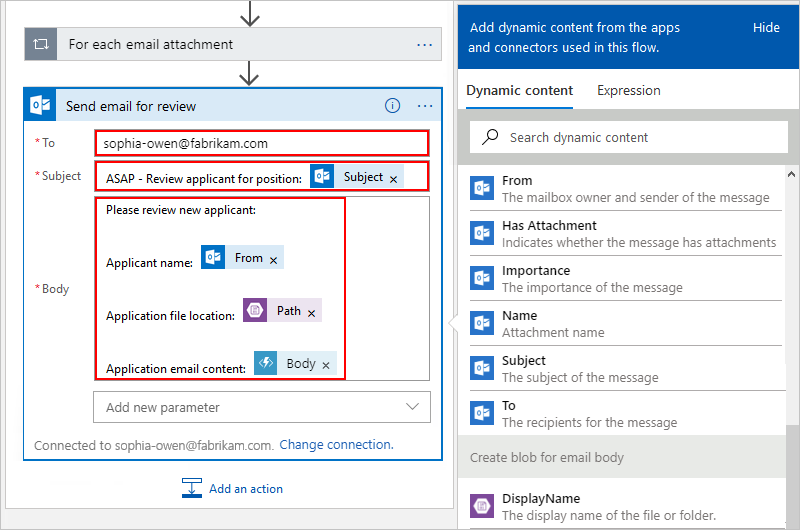 In the For each email attachment loop, choose Add an action so you can specify the task to perform on each found attachment. Blob name Name field For this example, use the attachment's name as the blob's name. Click inside this box so that the dynamic content list appears, and then select the Name field under the When a new email arrives action. Blob content Content field For this example, use the Content field as the blob content. Click inside this box so that the dynamic content list appears, and then select Content under the When a new email arrives action. Your email has at least two attachments. For now, just create two empty text files and attach those files to your email. Check that your logic app saved the email and attachments to the correct storage container. 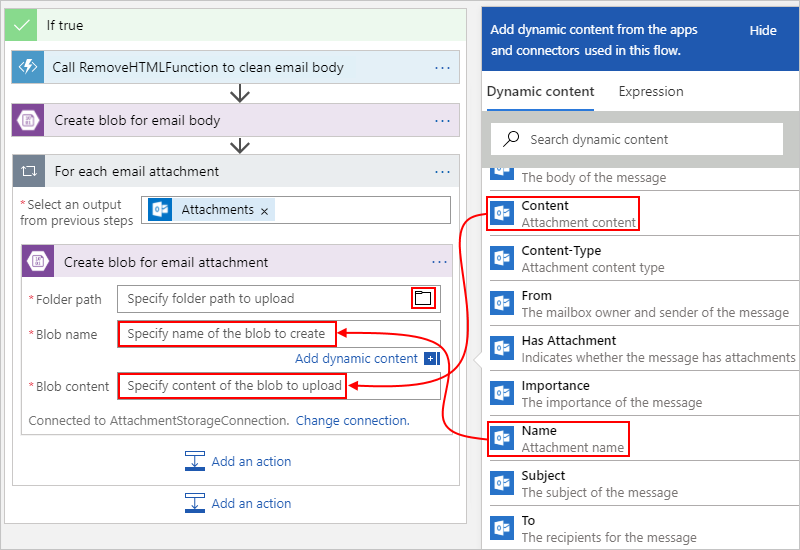 Check the attachments container for both the email and the attachments. When you're done, delete the email and attachments in Storage Explorer. Next, add an action so that your logic app sends email to review the attachments. In the If true branch, under the For each email attachment loop, choose Add an action. In the search box, enter "send email" as your filter, and then select the "send email" action for your email provider. To filter the actions list to a specific service, you can select the connector first. If you're asked for credentials, sign in to your email account so that Logic Apps creates a connection to your email account. Provide the information for this action and select the fields you want to include in the email as shown and described. To add blank lines in an edit box, press Shift + Enter. If you can't find an expected field in the dynamic content list, choose See more next to When a new email arrives. Subject ASAP - Review applicant for position: Subject The email subject that you want to include. Click inside this box, enter the example text, and from the dynamic content list, select the Subject field under When a new email arrives. To <recipient-email-address> For testing purposes, you can use your own email address. If you select a field that contains an array, such as the Content field, which is an array that contains attachments, the designer automatically adds a "For each" loop around the action that references that field. That way, your logic app can perform that action on each array item. To remove the loop, remove the field for the array, move the referencing action to outside the loop, choose the ellipses (...) on the loop's title bar, and choose Delete. Your email has at one or more attachments. You can reuse an empty text file from your previous test. For a more realistic scenario, attach a resume file. Congratulations, you've now created and run a logic app that automates tasks across different Azure services and calls some custom code. When no longer needed, delete the resource group that contains your logic app and related resources. 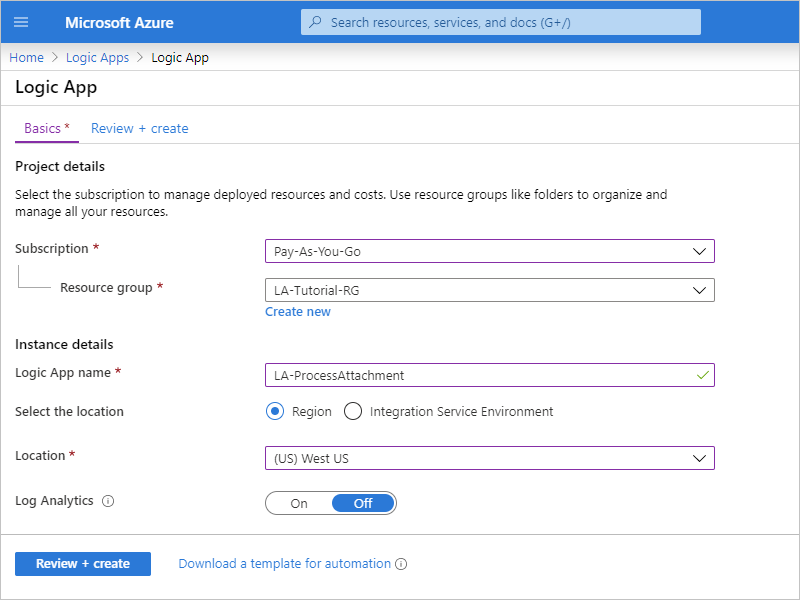 On the main Azure menu, go to Resource groups, and then select the resource group for your logic app. Choose Delete resource group. Enter the resource group name as confirmation, and choose Delete. 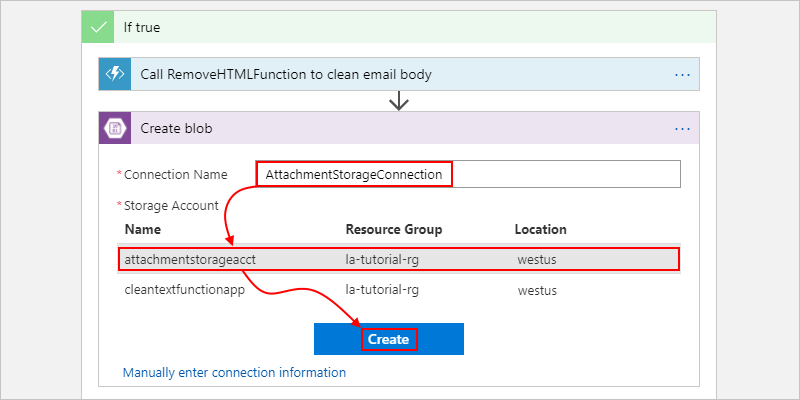 In this tutorial, you created a logic app that processes and stores email attachments by integrating Azure services, such as Azure Storage and Azure Functions. Now, learn more about other connectors that you can use to build logic apps.